The West MacDonnell Ranges are one of the major tourist attractions of Alice Springs. Especially the West MacDonnell National Park draws huge numbers of visitors. Only Ayers Rock and Kings Canyon see bigger crowds. There are several reasons why this area is so popular. To start with it's simply gorgeous. Ranges, gorges and waterholes, flora and fauna, hiking and swimming, everything one could hope for in a place like this. 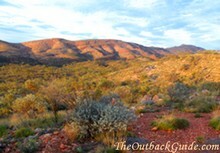 The other reason that the MacDonnell Ranges are so popular is that they are so accessible. The West MacDonnell National Park is close to Alice Springs, the road is all sealed, and there are plenty of facilities. I have lived in the remote north-west corner of Australia for a long time. My perception of distances, of good and bad roads, and of what constitutes "crowded" or "too developed" places is probably very different from yours. I may find the West MacDonnell Ranges a bit too touristy. For you it may be the wilderness adventure of a lifetime. It depends where you are from. Take everything I say with a grain of salt, okay? Where Are The West MacDonnell Ranges? If you guessed west of Alice Springs you guessed right. 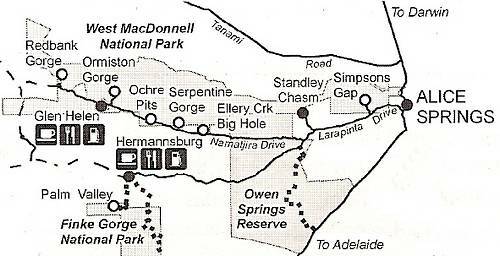 Alice Springs itself is located at a gap in the MacDonnell Ranges (Heavitree Gap). The mountains to the west of the gap are called the West MacDonnell Ranges, and the eastern side obviously the East MacDonnell Ranges. From Alice Springs follow the Larapinta Drive westwards. The turn off to the first attraction - Simpsons Gap - is only 18 km from Alice Springs. Simpsons Gap is so close to Alice Springs, there is even a cycle path going out there. If you keep following the road along the ranges (first the Larapinta Drive, then the Namatjira Drive) you just find one attraction after the other after the other. The distance to Glen Helen Outback Lodge, which marks the end of the bitumen, is 132 km. The name says it, Simpsons Gap is another gap in the ranges. The best thing about it is that everybody can get to it, whether you have transport or not. Just hire a bicycle for a day. It's a 17 km ride one way. Simpson's Gap is a pleasant spot and there are a few walking tracks in the area, as well as picnic facilities. The best thing about it though is the colony of Black-footed Rock-wallabies that lives on the rocky slope. You're just about guaranteed to see some of them, especially mornings or afternoons. Standley Chasm, 50 km west of Alice Springs, is the only privately owned gorge in the West MacDonnell Ranges, and that means there is an entry fee to cover the maintenance of the facilities. The narrow chasm is truly spectacular. At lunch time, when the sun is right above it, the steep walls light up in orange and the bottom of the chasm fills up with tourists. We were here in the late afternoon, and I enjoyed our visit a lot more than I had expected. 6 km after Standley Chasm you come to an intersection. Take the Namatjira Drive to your right to follow the West MacDonnell Ranges. Ellery Creek Big Hole is the deepest waterhole in the West MacDonnell Ranges and great for swimming. Since it's only 91 km from Alice Springs it's the perfect destination for family day trips and picnics. The pool is in the shade most of the time and the water is freezing cold. Very invigorating! But I'd be careful when swimming here in winter. 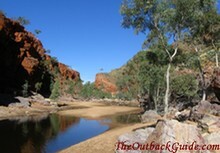 13 km further on you find Serpentine Gorge, another waterhole. This one is much smaller, and swimming is definitely a no-no here. Small waterholes like this protect very fragile ecosystems. The fish depend on the grassy edges as their breeding grounds, and people trampling through it would destroy everything. It used to be possible to drive in all the way, but the track is closed now. You can walk the few kilometres to the waterhole following either the track or the river bed. To the right of the waterhole you find a steep but short track to a spectacular lookout. Well worth the climb! 11 km west of Serpentine Gorge you find the Ochre Pits. This is the area where the Aboriginals mined ochres for their ceremonies, but also for trading with other groups. Certain kinds of ochre are rarer and more valuable. A short path leads down to the pits where you can see the white, yellow and red layers in the walls. The turn off to Ormiston Gorge is only a few kilometres east of Glen Helen, or 128 km from Alice Springs. 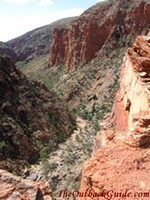 The main attraction of this very popular (read: crowded) destination is the narrow gorge on the Ormiston Creek itself. 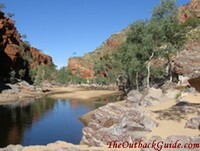 Not far from the campground and visitor centre is a permanent waterhole for swimming. Always a plus. Walking is the main activity here. The shortest walk takes you just down to the waterhole for a swim. Medium length walks lead through the gorge or along the ridge to a lookout. 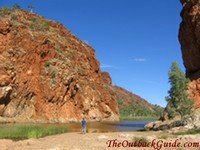 The longest walk is about 7 km and takes you through the Ormiston Pound (a huge natural amphitheatre), and then back through Ormiston Gorge for your well deserved swim. Glen Helen is another one of the important permanent waterholes in the West MacDonnell Ranges. It looks spectacular in promotional photos, and is impressive in real life, too. But as a destination I think it's overrated. There's not much to do here other than wander down to take your photo, and then spend money at the lodge. One thing I found a bit confusing here is that signs at the top explain the importance of the waterhole in all detail and ask you not to swim, and when you get down there they have a life ring... Most tourist information materials also say you can swim here. So what is it? I think you really shouldn't. But tourists usually stop where they can swim, maybe that's why the request is not emphasized more. Of all the places I visited in the West MacDonnell National Park this is my favourite. Redbank Gorge effortlessly took out the awards for best campground and best walk. The gorge is gorgeous, too. Redbank Gorge is located 156 km west of Alice Springs. After Glen Helen the road is unsealed. They were working on it though, so that may change in the future. For now the road is unsealed, and that seems to be enough to leave most of the other people and the whole mass tourism atmosphere behind. Pictures of Simpsons Gap, Standley Chasm, Ellery Creek Big Hole and Redbank Gorge are courtesy of Tourism NT, © Tourism NT.